When users search your website for properties, they will notice a property alert action button in the results. 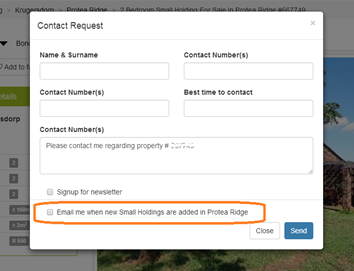 Clicking on this opens up the property alert signup form, pre-populated with their search criteria to save time. An separate property alert signup form can be activated from your Flex website menu, banners or other links on your website. When a potential buyer or tenant is interested in your property listing, they will click on the enquiry form to leave their details. On here there is a simple integrated checkbox option for property alerts. The system will check criteria like property type, price and area for the current property, and automatically subscribe them to new properties that match. 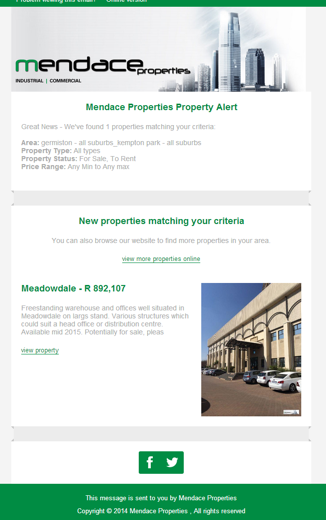 Email alerts are branded with your company logo and colours. Subscribers can easily unsubscribe or view details property listing info on your website. 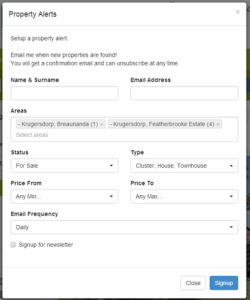 With the Property Alerts feature enabled on your Flex real estate website, you can reach more potential buyers all the time, even when you are not working! There is no limit on the number of alerts users can setup, and no limit on the number of subscribers you can have on your website.